Preheat oven to 350°F. Spray a cookie sheet with cooking spray. 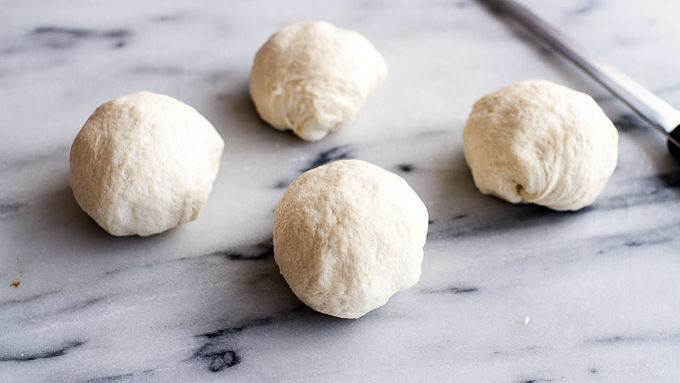 Remove the dough from can. Cut each loaf into 4 equal pieces. Shape each piece into a ball and place them seam-side down (so dough is smooth on top) onto the cookie sheet. Bake for 22 to 26 minutes or until golden brown. Meanwhile, heat the olive oil in a pot. Add the onions and sausage and cook until the onions are soft and the sausage has browned, about 10 minutes. Add the mushrooms and cook another 5 minutes. Add the chicken broth, tomato sauce, Italian seasoning, pesto and Parmesan cheese. Simmer for 10 minutes or until the bread bowls are ready. When the bread bowls have cooled, cut the top off each loaf with a sharp, serrated knife. Press the bread inside the bread bowl down, making room for the soup. Spoon about 1 to 1 1/2 cups warm soup into each bowl and serve. 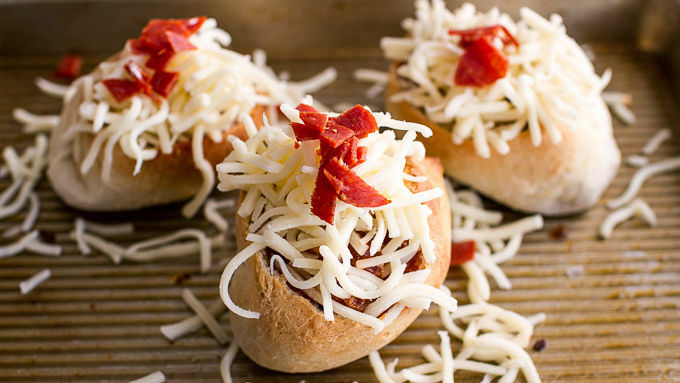 Sprinkle the top of each bowl with mozzarella and then add a pepperoni slice. Place under the broiler for 1 minute or until the cheese is melted. 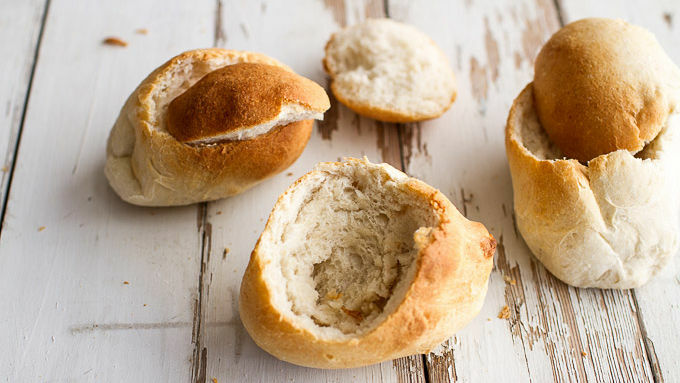 Place the top of each bread bowl next to the filled bread bowl on a plate. Serve and eat immediately! Make this recipe vegetarian, if desired, by omitting the sausage, adding more veggies, and substituting vegetable broth for the chicken broth. Like pizza... but better. 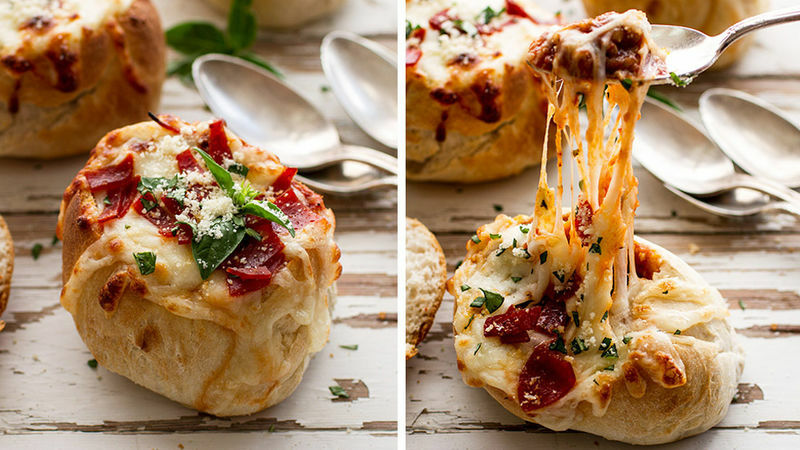 Cheesy pizza ingredients are nestled into a fresh bread bowl. Today I'm bringing you soup to cozy up to during these cold winter days. It’s perfect for this time of year – my guess is that many of you are lounging around with family and friends, enjoying the holidays. Have you ever had soup in a bread bowl? It's my very favorite way to consume soup because not only do you get creamy, hot soup, you get a pretty big hunk of fresh bread along with it to soak everything up. YUM. 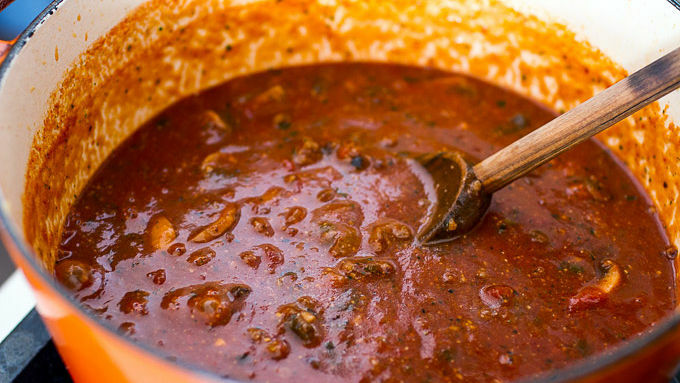 The best part about this soup is that it’s like pizza, only slurp-able! 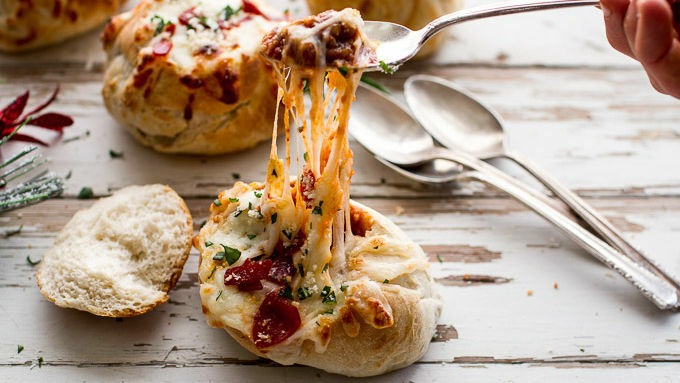 It’s cheesy, filled with sausage and topped with mozzarella and pepperonis. So cozy, so delicious and perfect for wintery days with those you love! Make this recipe vegetarian, if desired, by omitting the sausage, adding more veggies, and substituting vegetable broth for the chicken broth. Enjoy every cheesy bite!